If you like, you can meet the artist and "take the band home in a box," as Craig Eichhorn will suggest at the Dakota. February brings three CD releases by three area artists, each a unique talent and a major presence on our music scene. The first happens tonight (Wednesday). This is a jazz column, and "Hi-Top Sneakers" is not a jazz CD, but I've been a Daddy Squeeze fan since he came to my house several years ago and played for a bowling party. He's so busy with his other bands (Café Accordion Orchestra, the Rockin' Pinecones) and gigs (he's a frequent guest of the Guy's All-Star Show Band on "A Prairie Home Companion") that I'm surprised he had time for a solo CD, especially one with all-original tunes. It's a rollicking mix of roots music and Western swing, jug band, Latin jazz, Colombian cumbia, gospel polka, Parisian romance and kitchen sink. If you can sit still while hearing it, you're probably dead. Newton's CD releases often include dancing, and although the Varsity is not a dance hall, "people can feel free to make their own space to dance," Newton says. "Almost all the music I play is dancer-friendly." A self-taught musician who began on piano, Newton earned his name and fame playing the accordion, an instrument widely considered uncool. By mastering a variety of musical styles and surrounding himself with other fine musicians, he made it cool. 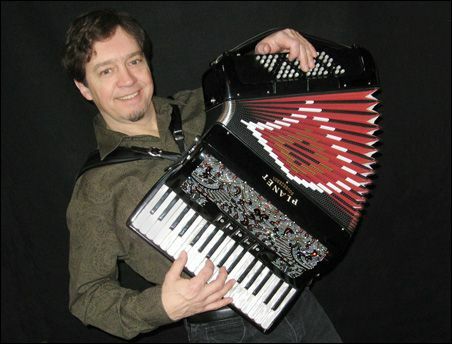 "I guess I've never been too concerned about being a part of the accordion world," he says. "One of the things that sets me apart from the stereotypical accordionist is the music I choose to play. Fortunately, most musical traditions before rock had a history of accordion. So it was easy to find recordings of accordions in Jazz, Western Swing, Country, Tex-Mex, Blues, Cajun, Latin, Scandinavian, Irish, et cetera … all the music that I liked to play. Or maybe it's because I'm just an old hippie at heart." For the Varsity gig, Newton will sing and play accordion and piano, maybe tambourine and kazoo. He'll bring the musicians who joined him on the CD, including Pat Donahue, Gary Raynor, Bob Ekstrand, Tom Lewis and Steve Kaul. Apologies for the late notice, but imagine what this music can do to lift the "it's-too-cold-for-February-won't-winter-ever-end?" blues. See him perform here. "My Attorney Bernie," "Zoot Walks In" and "Peel Me a Grape" ("Pop me a cork/French me a fry") are a few of the smart and witty tunes on Evingson's latest CD, her eighth. Earlier releases spotlight gypsy jazz, the Beatles and Peggy Lee. This time it's songs by St. Paul native and jazz great Dave Frishberg, a four-time Grammy nominee the New York Times described as "the Stephen Sondheim of jazz songwriting." The songs are first-class, including better-known and lesser-known Frishberg gems. Some are wry and others are romantic, giving Evingson ample room to display her impeccable interpretative skills. She's in beautiful voice on the CD and you can expect the same at the Dakota, where her band will include Karr, Gordy Johnson, Phil Hey, and Mark Henderson — everyone who appears on the CD except Frishberg. His place at the piano will be taken by Phil Aaron, and you won't mind a bit. It will all be very classy. True, Williams already had a CD release event at the Dakota in early January. But if he wants another one across the river, who's going to stop him? There will probably be at least one table full of his grandchildren, and plenty of the AQ's regulars will come out to celebrate "Mr. Smooth," who's "88 and playing great." Some of the songs on "Finality" are wistful and nostalgic — "Wee Small Hours," "Old Folks" (he'll try to tell you this is his theme song), "Too Late Now." Others, like "Come Rain or Come Shine," swing hard. His tone is sublime. For the CD release, it's likely he'll be joined by Peter Schimke, Gordy Johnson and Kenny Horst. I waited too long to start listening to Williams and I've been trying to catch up ever since. This is jazz everyone can enjoy, full of emotion, wisdom, experience, and soul. View a video of Williams performing at his own 88th birthday party at the AQ here.